Data is getting generated from different sources. Walmart handles more than 1 million customer transaction every hour, Wikipedia handles billions of pages. Social networking sites Twitter, Linkedin and Facebook etc. generates new huge bytes of data in quintillion daily, the amount of data is only getting larger, deeper and more complex. Data is considered as an asset today that’s because; its analysis adds value to business even, it is also being monetized directly or indirectly. How information visualization add value to business? Data is useless, if it is not adding any business value or information to empower making better decision. Some individuals learn better through visuals while others are attracted towards text. Data in text format can be confusing but Intuitive visual representation of data helps user to make better decision quickly that in turns adds value to business. I recently attended a seminar on “information visualization”, where speaker Aniket Mohan Sarangdhar shared his experience of the information visualization. Here in this article I am summing up the learning; I got from that seminar + my observation and experience in the same field. Information visualization captures viewer’s attention and addresses complex problem through storytelling which is simplified using design. User gets information at glance to deduce insights quickly that in turns reinforce human cognition. How to effectively convert an abstract data to visual? In concise and simple words; understand the data first extract the data variables and match each data variable with most appropriate visual attribute. It is similar to identify which UI component is best for a specific data or task. After mapping the data variable with visual attribute, focus on the logical placement of the different visual attributes. 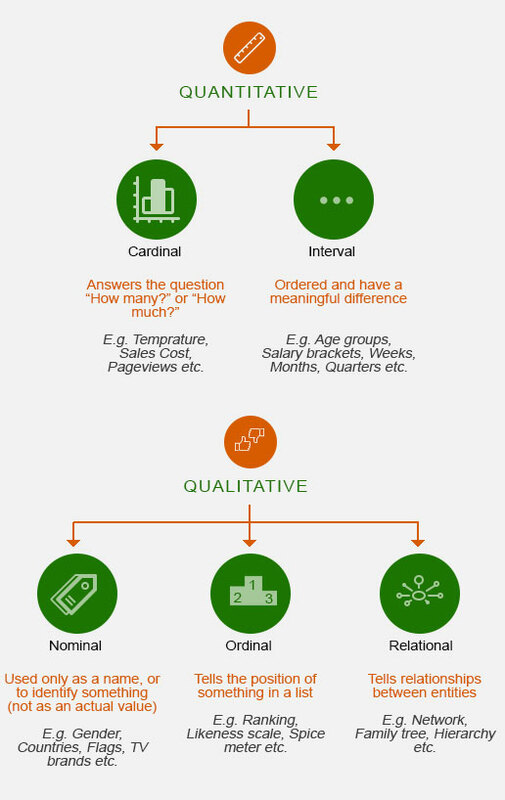 Now, let’s understand the terms used in above statement and the process in details with steps. As we understand the user before starting wireframing, similarly we need to understand the data for Information Visualization. The abstract data includes both quantitative (numerical) and qualitative (non-numerical) data. Let’s call it data set that will have number of data variables with different nature (type). Now, after understanding the data we need to understand different visual attributes that help to create effective information visualization. Now, we need to map each data variable with most appropriate visual attribute. Before that, first let’s understand visual attributes in terms of perceiving data accuracy. Visual attributes from most accurate to least accurate in terms of representing data accuracy. 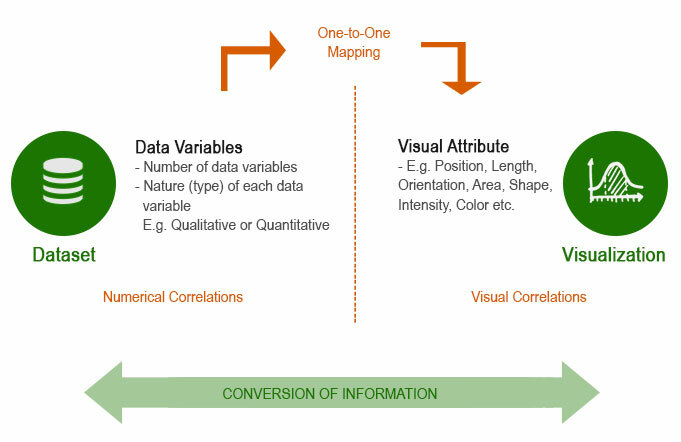 Visual attribute of data variables need to have one-to-one mapping. 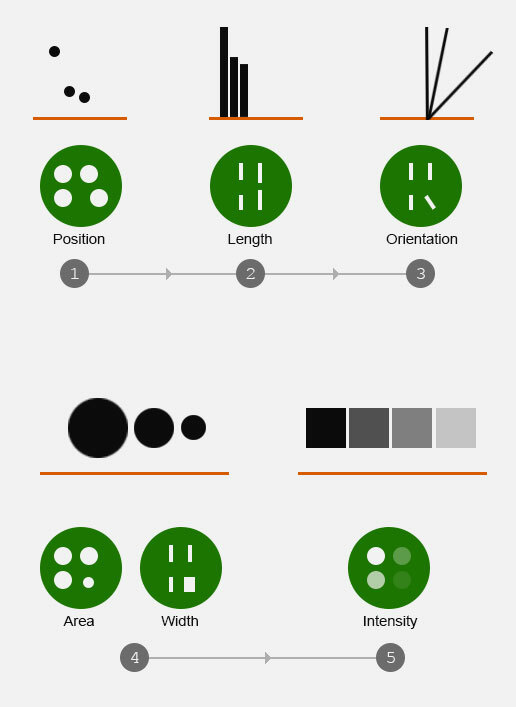 Visual attribute for a data can be position, length, orientation, area, shape, intensity, color etc. Each data variable needs to be mapped with one visual attribute. 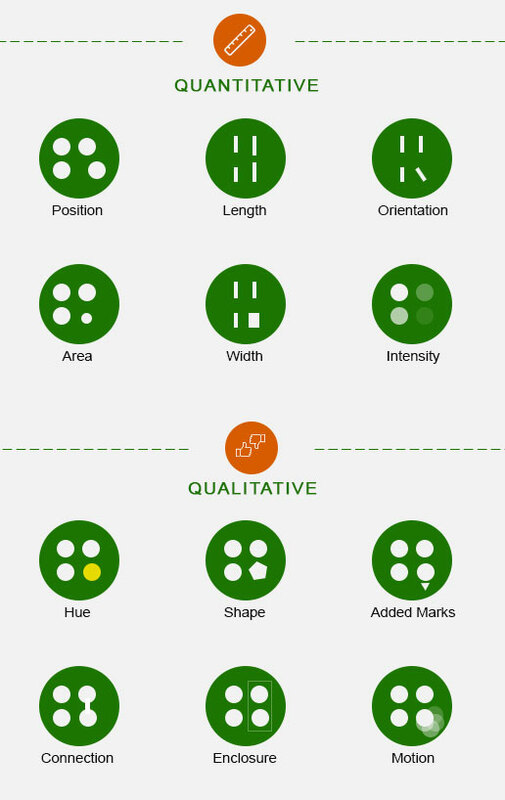 After this one-to-one mapping, focus on the logical placement of these visual attributes. So, that user can deduce insights quickly. Let’s create basic and static information visualization using the above understanding. We have understand the data and as a result we have data variables with data types. Now next step is; to map these data variable with most appropriate visual attribute. Position and Length are the two most appropriate attributes in terms of perceiving data accuracy. But the table that we created had one position and two length visual attributes. Color visual attribute was not mentioned. That was because; two data variable is mapped with same attribute i.e. length, and we need color to differentiate the variables. At the end we have 3 variables and at least 3 visual attributes, it may vary. Data visualization can be static or interactive. Charts and maps are the examples of static visualization. But representation of huge data or data set with multiple data variable need interactive data visualization. Next Next post: Is jQuery still a relevant library in front end development?